The Lexmark model X83 stands alone in its functionality and low cost. While there are many models from other manufacturers that perform similar duties, most of these are double or triple the Lexmark X83's $199 price. These others may have fax capabilities, but for the price difference, you can buy a standalone fax and STILL save money. Why a scanner and printer in one? While I have always been one to like things separate (as in component stereo systems), having a scanner and printer "tied together" causes a very unique synergy to occur -- Lexmark has created a standalone color copier, without giving up either the printer or the scanner. I feel that this copying capability is one of the main reasons to buy this unit, even if you already have a color printer and scanner. If you do decide to "couple" a separate printer and scanner, think of all the steps you need to go through to make a copy. You need to power up the computer, wait for Windows to load, start the right software program, wait for the scanner to warm up, scan the image, select the printer driver and print the image. To me, pressing a single button is far easier. Now members of your family don't have to become computer experts, just to make a simple photocopy. As a copier, the X83 has no complex default "modes" to set since there is a separate "Black and White copy" button and a separate "Color copy" button. Another useful feature is the reasonable ability to move the Lexmark X83 from room to room. It weighs about 15 pounds and all paper trays and guides are integrated into this single unit -- there are no external paper trays that need to be carried separately because they might fall out during moving. The scanner lock is external and easy to use. This integrated unit is the lowest cost color copier I have seen that is currently being manufactured. The fact that the Lexmark X83 also includes the printing internals of a Lexmark Z42 and 48-bit, 600x1200 dpi scanner are simply more reasons to buy. Therefore, I highly recommend the Lexmark X83. Hint: The Lexmark X83 makes a good present for the holidays (or anytime) for the "power-user" in your family. Not only will it connect to the PC via USB, technically challenged members of your family can also use it with great success! 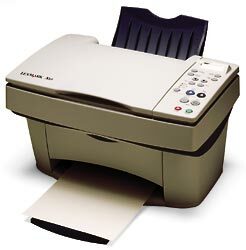 Hint 2: When buying this model at a retail store, be sure to write down "Lexmark X83" when you go. I have seen an improperly configured Lexmark X83 at a retail store and when someone wanted to see it work, they were shown a higher priced unit from another manufacturer (generally at 2-3 times the price).